A stunning tuxedo jacket. Inspired by movie stars for the black band on fishnet fabric and made for you with its perfect cut. 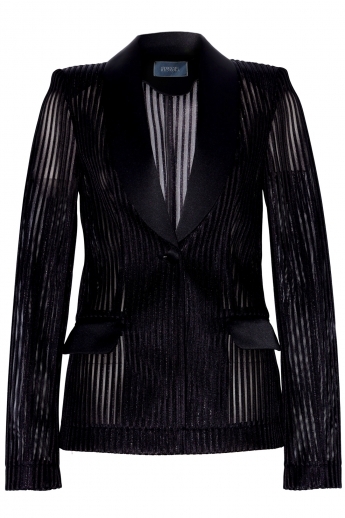 Slightly shouldered and with details of lapel collar and pocket in black satin to enhance the silhouette. A best in total look with its slim tuxedo short pants for a diva retro glam style ! Stefanie Renoma Original for a recognizable style among all and perfect comfort creations.